High-resolution photos of lava flows on Mars reveal coiling spiral patterns that resemble snail or nautilus shells. Such patterns have been found in a few locations on Earth, but never before on Mars. The discovery, made by Arizona State University graduate student Andrew Ryan, is announced in a paper published April 27, 2012, in the scientific journal Science. "I was interested in Martian outflow channels and was particularly intrigued by Athabasca Valles and Cerberus Palus, both part of Elysium," says Ryan, who is in his first year as a graduate student in ASU's School of Earth and Space Exploration, part of the College of Liberal Arts and Sciences. Philip Christensen, Regents' Professor of Geological Sciences at ASU, is second author on the paper. "Athabasca Valles has a very interesting history," Ryan says. "There's an extensive literature on the area, as well as an intriguing combination of seemingly fluvial and volcanic features." Among the features are large slabs or plates that resemble broken floes of pack ice in the Arctic Ocean on Earth. In the past, a few scientists have argued that the plates in Elysium are in fact underlain by water ice. Assessing those claims that ice was present today beneath the lava plates drove Ryan to study the area. "My initial goal," he says, "was to model the nighttime infrared temperatures of the plates. Then I became fascinated by the terrain lying between the plates and the high-centered polygonal patterns found there." This led him to look closely at every available image of the region. "I examined probably 100 HiRISE images of the area," he says, referring to the High Resolution Imaging Science Experiment camera on the Mars Reconnaissance Orbiter. In addition, he pored over daytime and nighttime infrared and visual images from the Thermal Emission Imaging System (THEMIS) camera on Mars Odyssey orbiter. (Christensen is THEMIS' principal investigator.) Images taken by the Context Camera (CTX) on Mars Reconnaissance Orbiter, the High Resolution Stereo Camera (HRSC) on Mars Express, and the Mars Orbiter Camera (MOC) on Mars Global Surveyor were all studied as well. "One evening," Ryan recounts, "I was making a second pass over the HiRISE images when I first noticed puzzling spiral patterns in an image near the southern margin of Cerberus Palus. I actually nearly overlooked that particular frame, thinking that it might not be too useful, being so far away from main study area farther north." He notes, "The coils become noticeable in the full-resolution HiRISE image only when you really zoom in. They also tend to blend in with the rest of the light-gray terrain – that is, until you stretch the contrast a bit. "I don't find it surprising that these were overlooked in the past. I nearly missed them too." On Earth, lava coils can be found on the Big Island of Hawaii, mainly on the surface of ropey pahoehoe lava flows. They have also been seen in submarine lava flows near the Galapagos Rift on the Pacific Ocean floor. As Ryan explains, "The coils form on flows where there's a shear stress – where flows move past each other at different speeds or in different directions. Pieces of rubbery and plastic lava crust can either be peeled away and physically coiled up – or wrinkles in the lava's thin crust can be twisted around." Similarly, he notes that scientists have documented the formation of rotated pieces of oceanic crust at mid-ocean ridge spreading centers. "Since the surface of active lava lakes, such as those on Hawaii, can have crustal activity like spreading centers do, it's conceivable that lava coils may form there in a similar way, but at a smaller scale." The size of Martian lava coils came as a surprise. "On Mars the largest lava coil is 30 meters across – that's 100 feet. That's bigger than any known lava coils on Earth," he says. Ryan and Christensen's work has inventoried nearly 200 lava coils in the Cerberus Palus region alone. Looking ahead, Ryan says, "Lava coils may be present in other Martian volcanic provinces or in outflow channels mantled by volcanic features. I expect that we'll find quite a few more in Elysium as the HiRISE image coverage grows over time." In a study published in the journal Geology, ASU researchers report that the Martian northern lowlands are largely composed of chemically weathered glass. In a study published in the journal Geology, Jim Bell, School of Earth and Space Exploration (SESE) professor and Briony Horgan, SESE exploration postdoctoral fellow, report that the Martian northern lowlands are largely composed of chemically weathered glass. Horgan and Bell began their research by collecting spectra data from the OMEGA imaging spectrometer on board the European Mars Express spacecraft. Because Mars Express is in an elliptical orbit, the spacecraft makes close passes over different areas of Mars, producing images from different times and elevations. The team used those images to produce a single map of the northern lowlands, and incorporated spectral data into that map. Translating spectral data, often represented in graphs, onto images made the spectra easier to analyze. Once the team had the spectra mapped, they began to investigate the iron mineralogy of the sediments. The researchers found that the spectra they were observing had signatures that were consistent with a glass-rich composition. Based on lab studies, the team was able to determine that glass content of the sediments was approximately 80 to 90 percent. Meteorite impacts can create glass, but usually not in the high concentrations that Horgan and Bell observed. Volcanoes, however, have the potential to create extremely large quantities of glass, especially explosive volcanoes that interact with ice and water. Horgan and Bell used Iceland, a location where explosive volcanoes are common, as an analog to hypothesize about the conditions that could have produced the Martian glass they found. Volcanoes in Iceland erupt underneath glaciers, and the interactions between water from the glaciers and lava from the volcanoes create incredibly explosive eruptions. The lava fragments, and transforms into particles of glass. Huge sand dunes and sand plain fields form that consist of 50 to 70 percent glass. Horgan and Bell hypothesize that the same process occurred during periods of volcanism on Mars. This possibility presents an interesting new idea of Martian geologic history. Previously, mineral mapping evidence has been interpreted to indicate that most volcanism on Mars has been effusive (dominated by lava flows). These findings support the idea that explosive volcanism was also important in the planet's past, perhaps more important than previously thought. Another intriguing finding is that the glass Horgan and Bell observed has been chemically weathered. The northern lowlands were formed in the Amazonian epoch, the current and most recent geologic epoch on Mars. Scientists think of this epoch, which has lasted for approximately three billion years, as a very dry era, dominated by ice and snow. Horgan and Bell suggest that the chemical weathering observed on the glass is a result of melt from ice and snow during this epoch. One question that begs further investigation is the exact nature of the glass deposits. Researchers are unsure of whether the northern lowlands are covered in a thick deposit of glass, or just a thin layer. 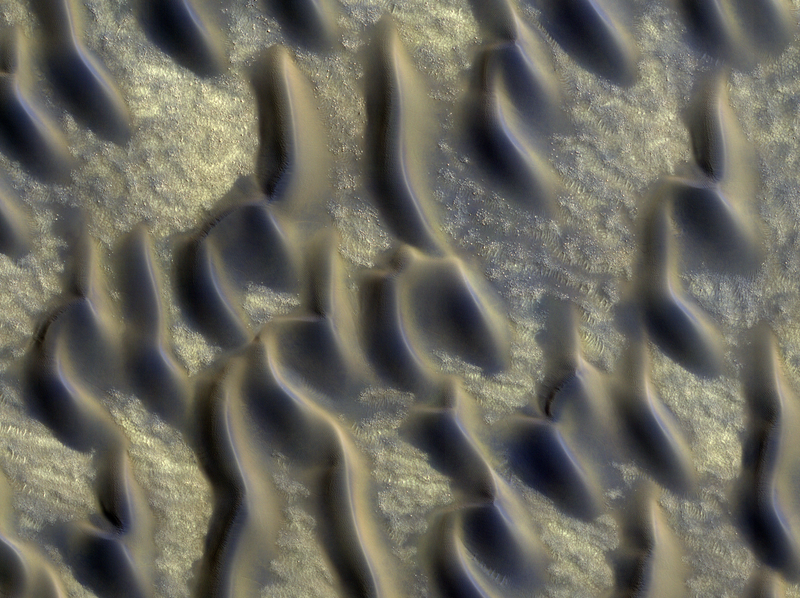 The team also wants to see if sand dunes in other areas of Mars also exhibit these same glassy signatures. This could provide more support for the hypothesis of explosive volcanism on Mars. Currently, the team at ASU is working on extending its map of Mars to cover the entire planet in order to explore some of the new avenues of research this study opens.